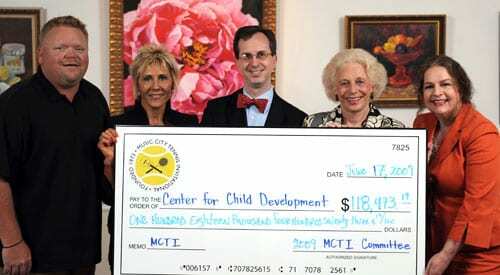 The 36th Annual Music City Tennis Invitational (MCTI) donated $118,473.19 to the Center for Child Development at Monroe Carell Jr. Children’s Hospital at Vanderbilt. The money was raised by 125 tennis players who participated in the tournament, along with sponsorships, donations, auctions and a songwriters’ concert that benefited the event. The annual MCTI charity tennis tournament has raised more than $1 million for Children’s Hospital at Vanderbilt and is the only fundraiser for the Center for Child Development. A Nashville tradition since 1973, this year MCTI received two esteemed awards from tennis organizations. The United States Tennis Association (USTA) selected MCTI as the 2008 Charity Tennis Event of the Year, and the United States Professional Tennis Association recognized MCTI as the Southern Charity Tennis Event of the Year for 2008. The 37th Annual Music City Tennis Invitational will be held on April 24-25, 2010. More information on player registration, sponsorship and volunteer opportunities can be found online at www.musiccitytennis.com. Pictured (l-r): MCTI Co-Chairs Bill Riddle and Phran Galante; Dr. Tyler Reimschisel, Director of Center for Child Development; MCTI Co-Chair Patsy Bradley; and MCTI Sponsorship Chair Patsy Wells.